With a breakthrough capacity of up to 400GB*, you can store even more hours of Full HD video7on the card without worrying about running out of room for the videos, photos, music, movies and other files you want to shoot, save and share. * 1GB=1,000,000,000 bytes. Actual user storage less. ** Up to 100MB/s read speed; write speed lower. Based on internal testing; performance may be lower depending on host device, interface, usage conditions and other factors. 1MB=1,000,000 bytes. 1 Results may vary based on host device, app type and other factors. 2 Full HD (1920x1080) video support may vary based upon host device, file attributes, and other factors. 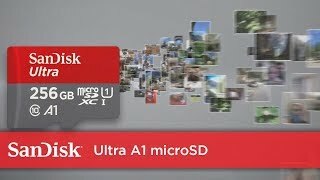 See: www.sandisk.com/HD. 3 Card only. See www.sandisk.com/proof. 4 See www.sandisk.com/wug. 5 Download and installation required; see www.sandiskmemoryzone.com. 6 Based on 4.1GB transfer of photos (avg. file 3.5MB) with USB 3.0 reader. Results may vary based on host device, file attributes and other factors. 7 Approximations; results and Full HD (1920x1080) video support may vary based on host device, file attributes and other factors.